We just finished hauling up the last core from this site. Final total is over 1000 meters of drilling (that is over 3,000 feet, or more then ½ a mile! ), and 9 days in a single spot. In fact, the JR has not moved more then about 5 meters in those 9 days. That is less then 17 feet. Considering the ship is over 143 meters long (469 feet) that is really impressive! But we are not finished at this site just yet. Because after we drill and recover the cores, scientists on board perform another set of measurements called downhole logging. We do this for a number of reasons, but the main reason is we rarely get all the core from the hole. There are spaces where the sediment was soft and was washed away, spaces where it was so hard the drill bits just chopped it into little pieces, or a whole bunch of other little things that add up to us not getting all of the core. Now, we do not get all the core, but we normally get some from each 9.5 meter (31 feet) core. So we know something about what is going on in that piece of core. We use downhole logging and the core we do recover to figure out what is going on in the spaces between what we get in core. Downhole logging is taking special types of the tools we have on board, and putting them down the hole we just drilled. In particular, there are downhole versions of the GRAPE, the P-Wave Logger, and something called resistivity, as well as a bunch of other measurements. Now resistivity works because the things the sediments are made of resist how electricity flows. So if we look at the lithologies, or the types of sediments we got in our cores, we can compare them to how the resistivity changes with depth to tell us something about what we did not get a core of. These measurements are combine to help us figure out the whole story. It is a little like reading a book where every third or fourth page it torn out. It makes it harder to understand, but you can usually figure out what happened. Now, Lambchop and I decided not to take pictures of the downhole logging equipment because it is really boring to look at! They have to be inside pieces of pipe to protect them from damage. So while they are very useful, and very neat for what they do, they are boring to look at. It is too bad really. Now, speaking of Lambchop, we last left the tour splitting the core. Now it is time to sample! Now, physical properties takes the first samples, but Lambchop has to talk to the other scientists about where not to sample. We do not want to sample a really important piece accidentally! Here is Lambchop talking to one of the Sedimentologists about a core. Sedimentologists are people who study the sediments in the core. What the sediments are made of, how well they stick together, are there any things in the core that might tell us how they were formed. We have many sedimentologists on board, this is Shouting, who is from China. Lambchop was saying his name wrong for a while. You say it “Shao-ting”, not shouting, oops! Even lambs make mistakes sometimes! So once Lambchop has talked about the core with the other scientists, it is time to sample the core. If the sediments are still soft, a plastic tube is used. 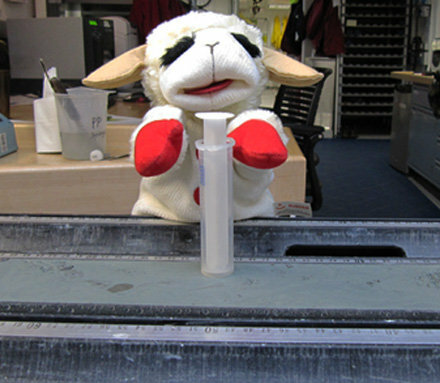 In fact, here is a picture of Lambchop sampling a core using one of these tubes. If the sediments have lithified, that means turned to rock, then Lambchop has to cut a sample out using a rock saw which looks like this. . .
Now, what does Lambchop do with this sample, well, you will have to come back and see!